Truth be told, I bought this DVF dress July and hadn’t worn it until our trip to Florida last month. I absolutely adore the Lisa Frank-meets-Flintstones print, but it felt a little too bold for Wisconsin. Screw that, though. Now that it has had its maiden voyage, I want to wear it all the time … with one minor alteration. The wrap skirt flutters up at the slightest breeze and I need to have it sewn shut (or at least have my tailor put in a couple of snaps). I actually had to use my tote to avoid any embarrassing wardrobe malfunctions! 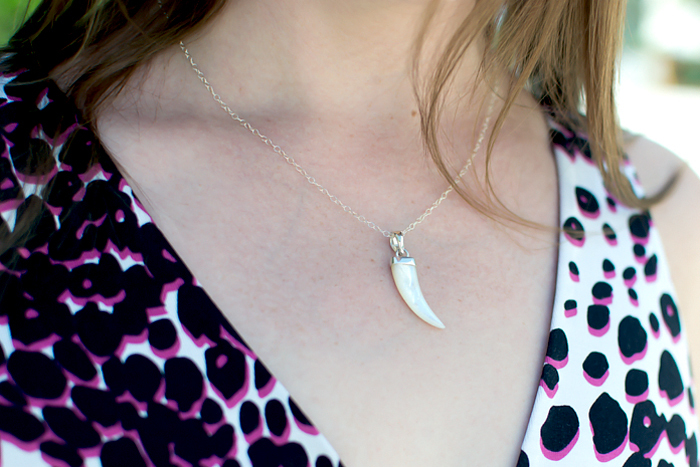 On another note, I’m obsessed with this mother of pearl tusk pendant from Rachelle of Pink Sole. It’s one of the most popular pieces in her Etsy shop. Seriously, I have the most talented friends.